The teen started a non-profit to help children in poverty. Vishal Vijay's life changed when he was 10. As a result, so did the lives of many other children. On a trip to Rajasthan in northern India in 2012, this privileged young kid from Oakville, Ont. came face-to-face with extreme poverty for the first time. "We were visiting some family there and passed through these slums. 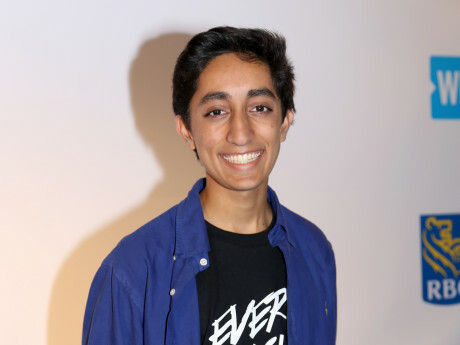 We got out because my parents wanted to show me different conditions that exist in the world," the now 16-year-old tells The Huffington Post Canada backstage at Toronto's We Day youth rally, where Vijay was a guest speaker. "This girl was begging on the side of the street. How is it that she is in this situation and that I'm not? I thought that's really unfair, and I need to do something about this." "I remember looking at this slum, and it had a lot of children there. It was in rubble. There was these little makeshift houses where people there didn't have very much. I remember seeing this girl, she was about my age at the time, and she had this dirt on her skin. She looked really skinny, she was very hungry, and she didn't look very happy," Vijay recalls. "I realized that she wasn't in school at the time, she didn't study. She was begging on the side of the street. That really made me upset. This girl is my age. How is it that she is in this situation and that I'm not? I thought that's really unfair, and I need to do something about this. So I took it up on myself to try and help her, and also help other kids living there." 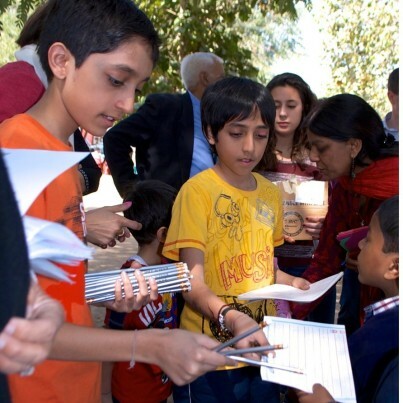 Vishal and Ishan Vijay handing out school supplies on a return trip to Faridabad, India. When he returned to his Toronto suburb, Vijay and his little brother Ishan started a group called Children in Action and started raising money to help kids back in India and other developing nations. It was later renamed EveryChildNow, so now kids don't have to join the C.I.A. What began with five friends is a now a national non-profit with school clubs from B.C. to Nova Scotia all working to help provide basic needs for kids overseas while also "inspiring and empowering" their fellow Canadian kids to make a difference. So far they've raised over $50,000, collected over 30,000 school supplies and helped thousands of children. "We've been able to build a schoolhouse, we've been able to build a well. We've been able to collaborate with the Canadian Museum for Human Rights to create a permanent children's rights exhibit," Vijay says proudly. "And now we're really excited that we're going to be building our schoolhouse mobile library, a computer lab library, to be able to give to kids which I saw in northern India on my trip there back in 2012. So we're coming full circle." Vijay says that EveryChildNow has also contributed to emergency response efforts to help kids affected by the Nepal earthquake, the Ebola outbreaks in Liberia and Sierra Leone and the Syrian refugee crisis. "We've taken kids to meet Syrian refugee families. We've served breakfast with them and sat down and had those conversations to welcome them." They also got hundreds of students from across the country to write pen pal letters to the newcomer kids to let them know that "Canada is this accepting place where everyone is welcome." The group also collects and distributes school supplies and books for disadvantaged children here at home, including in indigenous communities where schools receive less funding, with a campaign called "Read, Write, Repeat." "We don't see a lot of the injustice in our country. We think that everyone is fine and everyone is okay. But the fact is that there is so much need at home, and there is so much more that we can do here in Canada," he says. "As Nelson Mandela said, 'Education is the most powerful weapon that you can use to change the world.'" The straight-A student has been recognized for his efforts, including being named one of Three Dot Dash’s Global Teen Leaders in 2015 and winning the YMCA Peace Medallion last year as well as the Halton Multicultural Council's Recognition Award for Youth. "Young people aren't just our future, they're our present, too." And he wants others to recognize that what makes EveryChildNow special is not him or his brother, but that the organization is run by kids who choose to take action and make a difference. "Young people aren't just our future, they're our present, too," he says. "And it all begins with one small action, which is how we started."